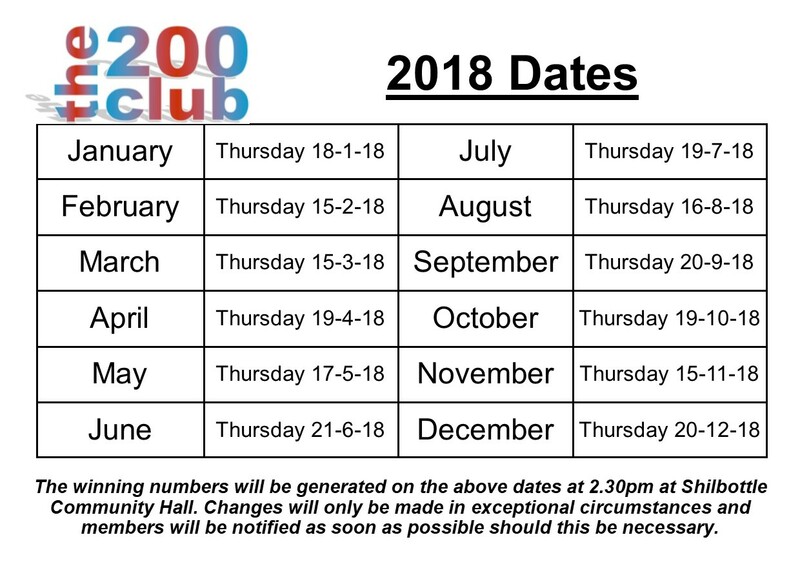 Shilbottle Community Hall runs a 200 Club, with numbers being drawn on the third Thursday of the Month at 2.30pm at the Hall, during the Afternoon Bingo session where possible. Each month there are six prizes detailed below. Members of the 200 Club are invited to attend the draw of the numbers. The draw is always witnessed by at least 2 people. The 200 Club costs £1 per number per month and a member is allowed to have more than one number. and will remain so as long as we maintain at least 80% of the numbers taken. We currently have 74% of the numbers taken, and so we are looking for new members. If you would like to join the 200 Club, please complete an application form (available from the Hall or downloaded below) and return with your money to Gill Bray at the Hall. Annual membership runs from January to December, so if you join part way through the year, only the remaining months need to be paid for that year. Prize winners are notified to the 200 club collectors and are posted on the Hall notice board, in the Chemist and on the website here, as soon as possible after the draw takes place.